New no deposit bonuses at their virtual casinos are better than ever, but what is the situation with their in-land casinos? Las Vegas is one of the most famous places on Earth, but is there something that you can only find in Atlantic City? Gambling was legalized in Atlantic City in 1976 and everyone thought this city would become the next Vegas. However, even though Atlantic City has managed to become a worldwide known casino destination, it will never come close. In the last couple of years, the city has been struggling. The competition is stiff, the expenses are enormous and it’s no longer enough to depend on the gambling industry. Sure Atlantic City has a lot to offer and they are looking for new ways to become even more attractive, but the other U.S. cities are there too. For instance, there are good casinos in Philadelphia and Miami and these places are significantly bigger. But no matter what happens, Atlantic City will always remain unique. Not only because of its casinos, but also because of the Miss America pageant, the famous boardwalk, and nice beaches. The gambling industry in Atlantic City has been facing many challenges lately. The revenues are decreasing and the economic situation is becoming more difficult. However, their online casinos have been growing rapidly and the revenues from virtual gambling have surpassed 100 million dollars. Hence, we believe they will save the gambling industry of this city and revive the economy. As for Las Vegas, the city is booming and their online casinos are attracting more and more players from all over the world. That’s hardly surprising since online casinos are the future of gambling and currently there are more than 1000 of them. Las Vegas has a big city feel and has more choices when it comes to everything, including gambling. It’s the most visited place in the world if we count both foreign and domestic tourists. Las Vegas has the population of approximately 650,000 people, while Atlantic City is home to fewer than 40,000 inhabitants. Hence, it’s difficult for them to compete with Vegas. Las Vegas has 169 traditional casinos and some of them are one of the biggest in the world. Atlantic City currently offers only 9 casinos and we can just hope this number won’t be smaller in the future. The revenues from the gambling industry have been decreasing and Atlantic City is facing many challenges. On the other hand, Las Vegas now has more tourists than it had 10 years ago. According to statistics, most people who visit Las Vegas spend a couple of days there, some even more than a week. When it comes to Atlantic City, the situation is entirely different. It is a popular day trip destination, especially among New Yorkers. It’s good to arrive there in the morning, take a stroll on the magnificent boardwalk, go shopping, spend the whole afternoon on the beach, have dinner at a restaurant and then go to a casino. We don’t say you can’t spend your whole vacation in Atlantic City, but the city is really not that big. There are fantastic attractions to visit and you can easily see the most important ones in one day. From our point of view, the number of attractions in Atlantic City is impressive, considering how small the city is. When talking about their locations, we need to take more things into account. Atlantic City gets a bit cold in the winter and it’s not so convenient to walk around the city during that season. On the other hand, Las Vegas has a subtropical desert climate and the winters are mild there. So, if you want to go to Atlantic City, you’d better do it in the summer or spring. Furthermore, Las Vegas is located in the middle of a desert and Atlantic City on the Jersey Shore. Atlantic City has stunning beaches and that’s perhaps its biggest advantage. However, the majority of hotels in Las Vegas have big pools, lazy rivers, and spas where you can relax. We know it’s not the same as the beautiful ocean, but it’s a good way to rest. These cities are far away from each other and it all depends on your preferences. Las Vegas has more sights, casinos and all other types of places you can think of. 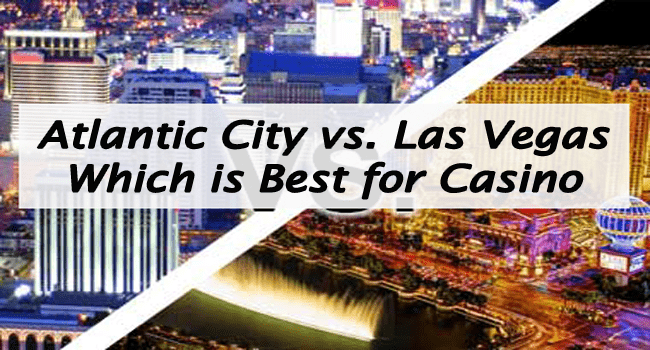 But that doesn’t mean Atlantic City is not worth visiting. Some of the perks you can find there simply don’t exist in other U.S. cities. Both of these destinations are good for serious and casual gamblers and even for those who aren’t so into gambling. Las Vegas is simply bigger and its gambling tradition is much longer. No place on Earth can compare to it and we don’t think that will ever change. It’s unique and awe-inspiring and its citizens have many reasons to be proud of their birthplace. Will Windows 10 Make The Windows Phone A True Contender?